The L400 Series Grade 1 Heavy Duty Auxiliary Mortise Deadbolt locks are designed for use as primary locks where no latching is required, such as restrooms and small doors to utility spaces. They also offer optimum security when used as auxiliary locks in other applications. L460 Cylinder x Thumbturn Deadbolt thrown or retracted by key outside or thumbturn inside. 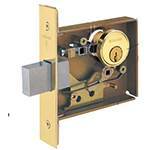 L462 Double Cylinder Deadbolt operated by key from either side. L463 Classroom Deadbolt thrown or retracted by key from outside. Inside thumbturn cylinder retracts deadbolt but cannot project it. L464 Cylinder Deadbolt thrown or retracted by key from one side. No trim on opposite side.